The muted tidal regulator (MTR) was developed by Nehalem Marine Mfg. over a 14 year period between 1998 and 2012. As technology revealed that off channel tidal habitat was perhaps the most converted and dysfunctional of all types of Salmon habitat the need for meaningful restoration of these heavily settled areas was critical to recovery. The process started early with the invention of better overall tide gate designs and the “Mitigator” fish passage device. Nehalem Marine went on through many different design options and inventions including various auxiliary doors and controllers. This design evolution culminated in the present MTR design. The goal of the MTR is to maximize both quantity and quality of fish passage, improve interior water quality, restore the juvenile habitat range. Current land use is a huge factor so the design goal in many cases is to allow maximum restoration values that remain compatible with current land use. 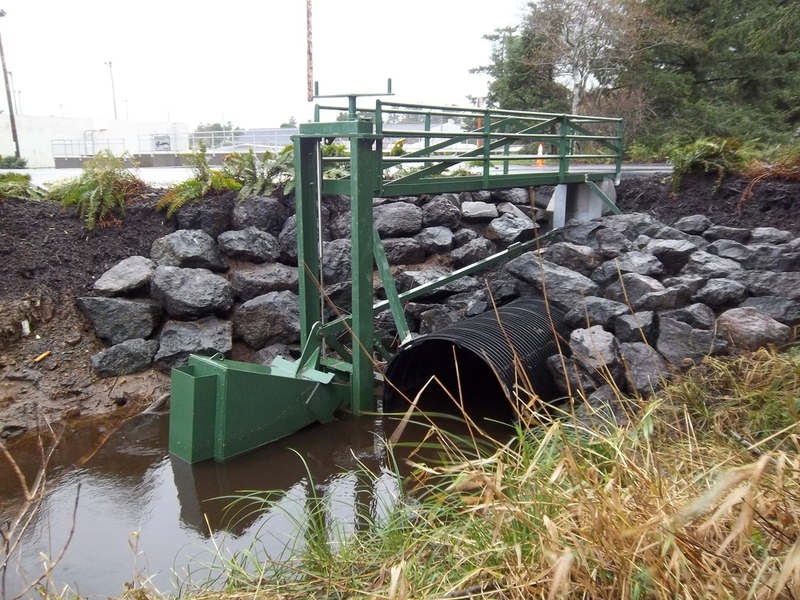 Traditional tide gates featured heavy wooden or metal top hinge doors that even when open pose a formidable barrier to fish passage and no tidal exchange. By design they are DEFAULT CLOSED. They remain firmly closed until substantial differential levels force them open. This means for example, during dry seasons, there may be long periods with no fish passage. A huge improvement came with the MTR because these systems become DEFAULT OPEN. This means the system will normally be in an open condition, providing tidal exchange and fish passage, any time the interior water level permits it. Much of the improvement is obtained by providing an auxiliary source of energy to open the gate even during times of very small or absence flows. This energy is derived from a weighted float tank (modulator) falling. In many cases the MTR will actually force the door open against a small head creating an additional tidal exchange. The MTR is revolutionary and exclusive because gate control is dependent on the INTERIOR LEVEL. All attempts at tide gate controllers up to this time were dependent on EXTERIOR LEVELS. Exterior levels are highly dynamic and using them to control tide gates normally ends in restoration levels being compromised. Interior level precise control allows the highest level of restoration allowed by the current interior land use. Of course the highest level of restoration is always obtained by FULL reconnection but in most cases infrastructure and development will not allow that. At this time the MTR represents the highest level of fish passage and restoration short of reconnection. The MTR opens the tidegate through a series of linkages which move as a reaction to the modulator(float tank) rotating downward. Likewise, when the modulator rotates upwards(due to the rising interior water level) these linkages close the tidegate. View some of our earlier MTR & auxiliary doors here.